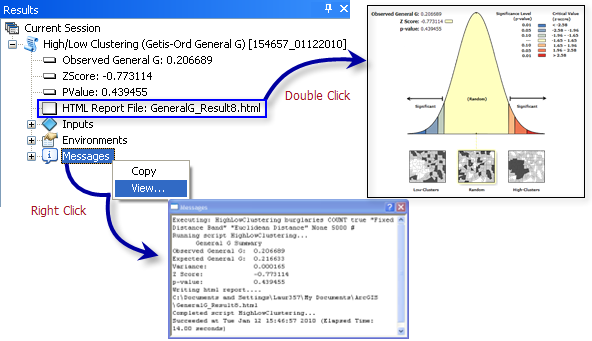 Measures the degree of clustering for either high values or low values using the Getis-Ord General G statistic. The High/Low Clustering tool returns four values: Observed General G, Expected General G, z-score, and p-value. These values are accessible from the Results window and are also passed as derived output values for potential use in models or scripts. Optionally, this tool will create an HTML file with a graphical summary of results. Double-clicking on the HTML file in the Results window will open the HTML file in the default Internet browser. Right-clicking on the Messages entry in the Results window and selecting View will display the results in a Message dialog box. If this tool is part of a custom model tool, the HTML link will only appear in the Results window if it is set as a model parameter prior to running the tool. For best display of HTML graphics, ensure your monitor is set to 96 DPI. The Input Field should contain a variety of nonnegative values. You will get an error message if the Input Field contains negative values. In addition, the math for this statistic requires some variation in the variable being analyzed; it cannot solve if all input values are 1, for example. If you want to use this tool to analyze the spatial pattern of incident data, consider aggregating your incident data. The Optimized Hot Spot Analysis tool may also be used to analyze the spatial pattern of incident data. The higher (or lower) the z-score, the stronger the intensity of the clustering. A z-score near zero indicates no apparent clustering within the study area. A positive z-score indicates clustering of high values. A negative z-score indicates clustering of low values. In ArcGIS 10, optional graphical output is no longer displayed automatically. Instead, an HTML file summarizing results is created. To view results, double-click the HTML file in the Results window. Custom scripts or model tools created prior to ArcGIS 10 that use this tool may need to be rebuilt. To rebuild these custom tools, open them, remove the Display Results Graphically parameter, and resave. This tool will optionally create an HTML file summarizing results. HTML files will not automatically appear in the Catalog window. 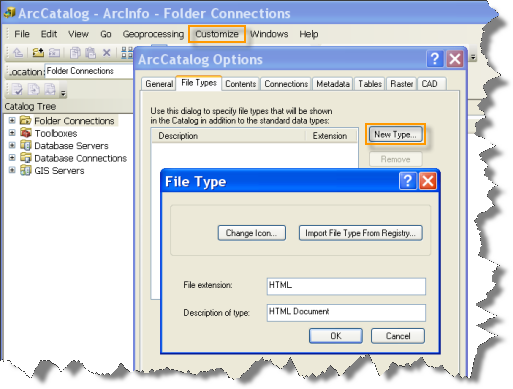 If you want HTML files to be displayed in Catalog, open the ArcCatalog application, select the Customize menu option, click ArcCatalog Options, and select the File Types tab. Click on the New Type button and specify HTML for File Extension. The feature class for which the General G statistic will be calculated. The observed General G statistic. The following Python window script demonstrates how to use the HighLowClustering tool. The following stand-alone Python script demonstrates how to use the HighLowClustering tool.